By far, the most important tip is to keep your dog away from the barbecue grill. This holds true for children as well. Make sure your grill is away from where the dogs and kids play, as well as at least 10 feet away from the house. You wouldn’t want anyone to knock over the grill and hurt themselves or accidentally set something on fire. Make sure your dog stays away from the food. Keep the food out of reach. Too much fatty foods that your dog is not used to eating can make them sick. And certain foods can be dangerous for your dogs to eat – food like chicken and pork bones, chocolate (like chocolate cupcakes and such), onions, and some nuts. Ask your guests not to give your dog any scraps. That can be difficult so perhaps put together a little dish of special dog treats that your guests can give them. Also, make sure the young kids are not walking around with their food. Your dog may take the opportunity to steal it. Not only could your dog eat something bad for them, but accidental biting could also occur – not to mention how unhappy the child may be when the dog eats their ice cream cone! Watch out for over-activity. A dog distracted by lots of fun and games may forget to drink water. Keep plenty of water available and check out our blog “Spring Water Safety for You and Your Dog” about how to look for signs of heat exhaustion. Keep the kids toys picked up when not in use. Some toys can be chewed into small pieces and ingested by your dog. Intestinal blockage could occur which could lead to injury or death. Also, keep plates, plastic forks, cups, and other items you find at a barbecue away from the dogs. Keep basting brush, tongs, and fork out of reach. Even a dog who is not generally inclined to chew may be temped by these things. Be sure to put trash in a lidded trash can. Have your dog wear sunscreen. If needed, put a little on their ears and nose to prevent sunburn. Make sure the sunscreen is non-toxic. We found an interesting article at PawNation.com titled, “What Your Vet Thinks About Your Pets Name and About You”. While this article is just the opinion of one vet, it makes you wonder if your own vet and other people may judge you based on your pet’s name. It is true that some people often judge others based on many factors, such as the clothing they wear, the kind of car they drive, age, race, etc. So it is not a far stretch for some people to judge you based on what you named your pet. But does it matter? Not really. I think it is much more interesting to explore the different pet names and the meanings behind them. My dogs, for example, are named from mythological persons. That is because I love history and culture. Sephi is short for Persephone in Greek mythology while Maya is short for MahaMaya in Hinduism. A customer at our Pet Auto Safety Blog told us about her little red Chihuahua mix named Salsa. Chihuahuas are a Mexican dog breed so the owner wanted to give him a Spanish name. And since the salsa food is generally red and the Chihuahua was red, Salsa just seemed like a perfect fit. How many German Shepherds have you met with a German name? Or Malamutes with an Inuit name? I had a dog named Cassie when I was a girl. I didn’t name her but the person who did named her after Lassie. Lassie was a Collie dog breed and since Cassie was a miniature version of the Collie (she was a Shetland Sheepdog), Cassie seemed like a perfect name for her. Do you know any dogs named Benji, Beethoven, or Marley? I knew a man who named his dog Frog Lips. He found this dog on the side of the road with his eye gouged out and an axe cut in his skull. The man saved the dogs life and fell in love with him. Frog Lips turned out to be a really great dog. But he probably would have been considered ugly by most people, considering the horrible scars he bore. So the man gave him a funny name to oppose the horrible tragedy he had lived through. A friend of mine has a dog named Liza after Liza Minnelli. I have heard other people with dogs named Hanna after Hanna Montana, Simba after the Lion King, or Jonas from the Jonas Brothers. I know a lady who found a little black dog wandering all alone on Manchester street. The dog was dirty and flea-bitten. He had no collar, tattoos, or microchipping. The lady took him to her home and cleaned him up. While she kept him in her home and searched for the owners, she called him “the dog from Manchester Street”. Needless to say, she fell in love him and was glad no one ever claimed him. He is called Manchester to this day – or Manny for short. I have also met dogs named from their personalities like Zippy, their appearance like Fluffy, and for their symbolism like Frank for a Dachshund (also known as a wiener dog). So how will you choose your pet’s name? Will it be after a famous person in history? A celebrity on TV, in the movies, or in music? Will you name him or her for her personality or physical traits? No matter how you choose it, it should be special – just like how your dog is going to be special to you. We recently read a great article at PawNation titled, “Police Dogs Receive Bulletproof Vests from Guardian Angel”. I have seen K-9s on duty before, but never one with a bullet proof vest. That is because the vests are very expensive. A K-9 is a huge asset to a police department. They do us a great service by helping to catch bad guys and protect the police officers who put their lives at risk to serve our community. So I think it is fantastic that there is a non-profit organization out there who helps collect money to purchase bulletproof vests for dogs. Check out the article above for more information on this organization and how you can donate. I Have a Purebred Dog with AKC Papers – Should I Breed Him? If you are considering breeding your dog, first ask yourself why you are breeding your dog. If you are breeding him or her to make money, you should know that responsible dog breeders do not make much money. It takes a lot of time doing research and money for vet bills to responsibly breed a dog. While we are not against breeding dogs, we are against “backyard breeders” and puppy mills. What are backyard breeders? Backyard breeders are people who breed their dog without any knowledge or concern about breeding inferior traits and genetic health issues. Just because a dog has papers from the American Kennel Club (AKC) does not mean that the dog has been bred responsibly. They could still have hidden genetic issues which may be passed on to their puppies. Proper and thorough research should be done before breeding any dog. Before you read the solution, check out the original puzzle, Encrypted Dog Breed Puzzle, posted on May 19, 2010. A = J, B = N, C= H, D = E, E = A, F = U, G = Z, H = Q, I = C, J = I, K = M, L = R, M = D, N = T, O = B, P = V, Q = Y, R = K, S = G, T = W, U = P, V = F, W = X, Y = O, Z = L.
11. What do all these dog breeds have in common? They are all from the Working Dog breed group. Decode the list below to reveal several dog breeds. Each letter in the code represents another letter of the alphabet. For example, let’s say that XYYGKA can be decoded to spell poodle. Therefore, X equals the letter P, Y = O, G = D, etc. This is an example only. The list below has its own code. By figuring out at least one of the dog breeds below, you can decipher the others using the same code. For a hint in figuring out the code, see the very end of this post. See the solution posted in a couple of days. Bonus – What do all these dog breeds have in common? Many people ask me what Dog Agility training consists of, and even more so how you should get started with this popular pastime. There are a lot of informative articles on the internet which cover the subject, but many of them do not spell everything out in black and white for the beginner, let alone provide any form of free training guide for your dog. I have happily been training my canines for over 8 years, and am happy to cover any Agility-based dog questions, answered for free. So, let’s get started! Q. 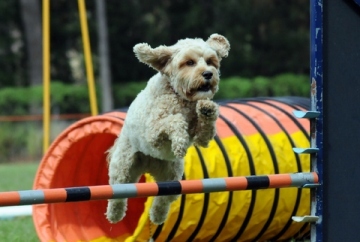 What is dog agility all about? A. Have you ever noticed how some dogs just seem to grin while they run up and down, to and fro, jump, bark, chase birds, fetch sticks, and generally enjoy life? Well, that is the starting point for dog agility. In addition to the sheer enjoyment for the dog and its owner, it also encourages a stronger bond between them and aids general behavioural training for the animal. The general idea is that dogs complete an obstacle course as quickly as they can, with penalty points awarded for missed or incorrectly tackled obstacles: the animal which completes the course in the shortest time and with the least amount of penalty points, is the winner. Q. Is it specific to any particular breed of dog? A. No. All shapes and sizes of dog can take part, although the type of course that the dog follows can vary according to the physical size of the animal. For example, you would not expect a Chihuahua to be able to clear a high jump built for a Great Dane! Dogs do not have to be pedigrees, either. Any mutt off of the street can have a go. Q. If I wanted to get started with dog agility, how would I go about it? A. First of all, decide if you want to do it for fun, or if you want to be fully competitive. Then decide whether you want to try it with the dog you already have, or (if you hope to become fully competitive) if you need to find a dog which is likely to do well in competition. Then find a local club or individual trainer who can get you on the way. Although there are many dogs who compete in both obedience and agility, there is no necessity for agility dogs to be as well trained as obedience animals. Nevertheless, next to a strong and happy relationship between owner and dog, control is essential to satisfactory and successful participation in agility events and competitions. Therefore, basic obedience is a necessity, and most clubs will require a demonstration of some of the more basic commands before accepting a dog (and owner) for an agility training programme. The commands that you and the dog will need to master to get accepted are: drop on command, down, sit, recall, wait, etc..
Q. How long will it take to train my dog for participation in agility events? A. First and foremost, it is very important that you do not enter a dog into a competitive environment before it is at least eighteen months old. Any earlier, and there is a very real risk that the animal may suffer physical problems or illness, as the animal’s body has not fully developed until then. After that, it all depends on the enthusiasm of you and your dog, and your dog’s intelligence and ability to absorb training. Q. What is the most important thing in dog agility? A. For you and your dog to have fun! I cried with tears of both sadness and joy when I read Chicken Soup for the Dog Lover’s Soul. I went through a whole box of Kleenex. While some of the stories were sad, they were only sad because of the immeasurable happiness that they brought to their owners before they passed on. One of the stories includes a very old story which you may have heard before. Every day, a man would go catch the trolley and his dog, Jack, would follow him. When the man got on the trolley, Jack would go home. But he would always come back to meet the man when the trolley brought him back home. One day, the man had to move but couldn’t take Jack with him. He gave Jack away to a family to take care of him, but Jack didn’t want that family. So he left. And every day, at the same time, he would go back to the trolley station and wait for his owner to come home. And every day for many days, the man didn’t come home. Thankfully, someone contacted Jack’s owner. He promptly came home and made sure that he caught the same trolley that he knew Jack would be waiting for. It was a happy ending for such a loyal and wonderful dog. There are many more such sad yet happy stories. There is one about the legendary fire dog in Chicago. His name was Felix and he even has a statue built in his honor. There is the one about Max, a beagle-mix who learned how to open the refrigerator. There is one about Bashur, the Iraqi dog and Gremlin, a US Navy dog. Go to our Amazon.com affiliate site called Dog Lover’s Book Store to order your book. 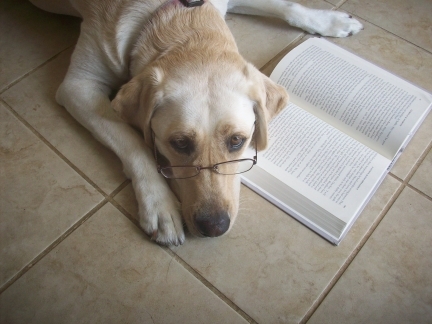 Check us out for more great dog book reviews. Reports are all over the internet that a company called Matter of Trust is accepting donations of dog hair in order to help with the Gulf oil spill. I have always wondered if there was anything useful which could be done with all my dog’s hair. I thought of pillows or some-such cushy things. But then I thought, what happens when I wash it? I don’t want that ‘wet-dog’ smell in my pillows. In all seriousness, donating dog hair to help a good cause like cleaning up the oil spill is a great idea. Check out Matter of Trust to see what other unusual items can be donated in order to help other issues. Matter of Trust specializes in finding good uses for man-made surplus and waste. If you have a dog, beware of purchasing cocoa mulch for your garden. While most dogs do not care for it, some dogs absolutely love to eat it. And if your dog eats it, he could die. Cocoa mulch is poisonous to your dog. It contains cocoa bean shells which contains a substance deadly to dogs, called theobromine. You may have heard that you should never give your dog chocolate – especially dark chocolate or any product made with cocoa powder. Like cocoa mulch, chocolate is made from the cocoa bean and contains theobromine. If you suspect that your dog has eaten cocoa mulch or any other product containing cocoa, take your dog to the vet immediately. Dogs who eat a large amount of cocoa at one time may experience vomiting and/or diarrhea several hours after eating eat. Other symptoms include increased heart rate, restlessness, muscle spasms, excessive panting, seizures, and/or coma. What is a large amount? It depends on your dog’s size and weight and your dog’s sensitivity. Dogs who eat small portions of cocoa over time may not exhibit immediate symptoms, but they could eventually develop seizures and other health problems.